Study: "Arctic was 5C warmer during the (LIG) Last InterGlaciation than at present" | Watts Up With That? Study: "Arctic was 5C warmer during the (LIG) Last InterGlaciation than at present"
The Eemian was an interglacial period which began about 130,000 years ago and ended about 114,000 years ago. It was the second-to-latest interglacial period of the current Ice Age, the most recent being the Holocene which extends to the present day. The prevailing Eemian climate is believed to have been similar to that of the Holocene. It is widely accepted that the last interglacial was much warmer than the current. Forests reached the Arctic ocean across most of Eurasia, Scandinavia was an Island due to higher sea levels, and hippos swam in the Thames. As a basic introduction to the subject the Wikipedia http://en.wikipedia.org/wiki/Eemian entry is well worth a quick read. The paper concerned, however, offers a comprehensive survey of literature concerning the Eemian interglacial, focused on the Arctic. The literature cited by the authors consists almost entirely of data from actual empirical research as opposed to “data” from model outputs. There are also four pages of citations for anyone who wishes to check the authors sources, or simply dig deeper. For those who have time, I highly recommend reading the paper in its entirety. Mean summer (M, J, J) insolation anomalies (Wm_2) expressed as the departure from present at 65N from 25 ka to present (upper panel) and from 140–115 ka (lower panel). See the paper for a thorough caption. How much warmer were Eemian summers? Evidence from the surveyed literature paint a consistent picture. The Atlantic-Siberian sector was typically 4-8C warmer, and Beringia 2-4C warmer. Alaska was 0-2C warmer in summer, but colder in winter. NE Canada and Greenland registered at least 5C warmer in summer. Temperate zones adjacent to the Arctic (and the planetary average) registered roughly 0-2C warmer than the present. This was apparently enough of a difference to facilitate vastly different plant and animal distributions. In some areas plant zones move 1000k north. Trees grew as for north as the Arctic Ocean and hippos swam in the Thames. There would have been however, much more estensive leads and the ice in places was at least 800km north of the present summer extent. Reduced sea ice and increased meridianal circulation of warm, salty Atlantic waters into the Arctic dramatically warmed Arctic waters relative to the present which then allowed for a much warmer northern Eurasia. There does not appear to be a consensus on exact ice cover in Greenland. Southern Greenland may have been ice-free or almost ice free while modeled estimates for the Northern Ice sheet are that it was reduced by 20-50%. There is at least solid evidence that some northern sites such as Dye-3 were not glaciated during the Eemian. The authors then illustrate the effects of “polar amplification” during glaciation: While global temperatures are estimated to be roughly 6-8C below present at last Glacial Maximum, Arctic cooling as evidenced by Greenland Ice Sheet boreholes was 25C. September 10, 2010 in Paleoclimatology. So, no detectable tipping point upto 8°C above the present IG ! Hansen proven incorrect again. Quel surprise ! Can anyone advise if there is any authoritive comment on Antarctic temperature in the Eemian as well. Present Arctic warming may have not reached its peak. As warm waters inflow increases, keeping Arctic’s temperature up, so it does outflow of the cold currents. This shifts ‘jet stream’ further to the south in the NW Atlantic as it was the case in the recent months, and may continue for some years to come. So, the Arctic can drop as much as 25C in the next glaciation. In the LIG, the temperature peaked early anywhere the data can be resolved. With the Holocene being the peak, the slow slide downhill is already evident. Further, in the paper, we don’t have enough fossil fuels available to completely melt the Canadian Ice, that taking 2,000 years. We have 200 years, if we play it right. We might be able to lessen the slope of the slide down to Ice Age, but we cannot stop it. Cooling is slow, but steady, and I think the reason for that is the Arctic mixes temp. differentials with the Antarctic over time. First you tell us that the arctic was different 7k years ago and now this! Are you seriously suggesting that our climate shifts through natural variation? Hogwash, its all our fault. The year, 2050. The place, southern England, Devonshire. The time, close to a New Ice Age as everywhere north is frozen solid! A professor of ancient languages & an anthropologost who has studied every existing cave-man writings & scribles, paintings, etc, & who has studied the capacity of the ancient human skull/brain & jaw vocal capacity has translated, the phrase, “Ooo, ooo, ooo, ugh, ugh, ugh, agh,agh, ooo, ooo, ugh”, through a highly validated language computer model using “representations”, “simulations”, & “sophistication”, from a humungous taxpayer funded state organisation, to mean,…… “It’s the freeking Sun, man, coupled with variations in orbital mechanics of the Earths rotation, speed of rotation, axial tilt, & wobble, & the variations in the gravitational effects of the other planets in the solar system upon the Earth up to & including our own planetary satellite, & the much misunderstood chaotic internal natural variations that these cause the Earth’s climate system, man, innit, nowotaaaameeen, bro?” It has to be pointed out that there are some uncertainties in this translation. I am interested in the conditions in the rest of the world at that time. Was the rest of the land world one big desert or was this moderated by more water vapour leading to moist conditions or more variable conditions. I’m not sure if I trust their conclusion that the arctic amplification they’ve measured is mostly due to positive feedbacks in the Arctic. The fact that the lower latitudes were hardly warmer than now IMHO points to a negative feedback at those latitudes – i.e. more clouds, more rain. And last but not least faster ocean transport of warmer waters to the Arctic. Arctic amplification during glaciations is a completely different issue. I’m so tired of the AGW crowd using the unstable climate during glaciations as evidence for possible unstable climate during warmer periods, when the records so strongly indicate that a warm climate is stable (because of the negative feedback in the hydrological cycle) while glacial climate is unstable. Interesting thesis, but they do not explain the basic mechanics of this event. They say that summer insolation in the N Hemisphere was increased by 11%, through “orbital parameters aligning”. I presume they mean the Earth’s elliptical orbit and its angle of inclination combined together to place the N Hemisphere closer, and more towards the sun, in the summer months (and thus away from during the winter months). And the much warmer summers do not allow the very cold winters to build up any ice at the poles. But an 11% increase in insolation due orbital parameters? That sounds like a awful lot to me. More Doomsday Warming scenarios crash and burn! How utterly unsurprising to discover that climate changes without any of mankind’s supposedly-malign influence. >>was the case in the recent months, and may continue for some years to come. Yes, but southerly jetstreams do mean colder winters too. So, in Arctic ice terms, which will win out – colder winters or warmer summers? And in continuation of my post. So these same orbital parameters would not effect the S Hemisphere during the LIG. During the LIG, the S Hemisphere would have been tilted towards the sun, in summer, but much further way. So the LIG would have been a N Hemisphere only event. The S Hemisphere ice ages would be out of synch with the North. Does this also show up in the record? The holocene also had much higher temps across Nth Russia and Siberia with boreal forests reaching the Arctic coastline. The temps were about 2.5c to 7c higher than today and the forests retreated to the present position by 3,000 years ago. Also the west Antarctic peninsula had at least 3 periods of warming during the Holocene over the last 5600 years, with one period in the MWP. Use a search engine lad. ” The warmest peak of the Eemian was around 125,000 years ago, when forests reached as far north as North Cape (which is now tundra) in northern Norway well above the Arctic Circle at 71°10′21″N 25°47′40″E﻿ / ﻿71.1725°N 25.79444°E﻿ / 71.1725; 25.79444. Hardwood trees like hazel and oak grew as far north as Oulu, Finland. The observed climate events back then would fit with a more active sun at the time allowing a highly positive AO and AAO with more poleward jets even than in the late 20th century or in the MWP whilst at the same time the ocean cycles were in a warmer phase than now adding to the poleward pressure on the jets. That would be one of the four basic sun / ocean interactions that I previously proposed. In that combination the sun and oceans are actually offsetting one another in that the oceans are releasing energy faster to the air yet that energy is moving faster through the system to space and warming the higher latitudes of the troposphere in the process even as the total energy in the system declines due to that faster energy release from the oceans. The total ocean energy content does not decline as fast as one might expect because the poleward shift in all the clouds associated with the jets and the ITCZ reduces global albedo and allows more solar shortwave input to the oceans which partially offsets the faster rate of energy loss from oceans to air. Just as we see offsetting situations predominate now during the current interglacial so it was then during that interglacial but then the precise details of the solar / oceanic interaction produced a slightly warmer troposphere than the current one. To fall back into an ice age with the concomitant huge tropospheric temperature swings one needs the solar and oceanic forcings to change phase relative to one another so as to be supplementing rather than offsetting each other’s effects. Proposing independently variable solar and ocean cycles and reversing the sign for the effect of a more active or less active sun on stratospheric temperatures supplies the necessary adjustment to climate theory to explain most if not all observed climate changes including switches between glacial epochs and interglacials. It becomes clear that higher summer insolation drove the higher Arctic temperatures 7K and 130K years ago. Something that can’t be said today about lower summer insolation at present. Therefore something else must be driving the current record Arctic sea ice minima and the record high Arctic temperatures of the current recent modern era. I wonder what that something else is? I mean two articles/posts about higher summer insolations in the past, which doesn’t exist today, must mean something. And I think I know what that something else is, it’s just something else meant to divert our eyes from the current record Arctic summer minima. Just think about this, right at the time when the current Arctic summer minima is about to occur, find articles about past Arctic conditions that were caused by other natural factors that don’t exist today. Good one A, it’s about time WUWT emphasized the fact that the modern era is different from other past natural causes, particularly at this time of year, when the record Arctic sea ice minima is upon us. Appreciate WUWT’s honesty in that regard. As the jet stream forms high in the upper troposphere over the boundary between two air masses of different temperature, the greater the temperature difference between the air masses, the greater the air pressure difference, and the faster the wind blows in the jet stream. I am not certain that the winter jet stream affects the Arctic at the same rate as it does the middle latitudes since it is normally well outside the Arctic circle. Obviously the evidence of all those primitive greenhouse gas-spewing SUV’s that early man drove during the Eemian did not survive until the current day. Which is not surprising considering that modern man has a tough time making a vehicle that the steel doesn’t rust through with only 40 years of reasonable use. By the next interglacial, all that remains of our vehicles might be the ceramic insulators of the spark plugs. Which will be hailed as the pinnacle of our ability to make decorative beads. Looks like what will happen when the Arctic Sea gets ice free in summer. Then the sun will just shine into that sea for a half year every year. Might the Arctic sea surface temperature then rise to say +10° C within maybe just a dozen years? So I guess this website has shifted from saying that the ice in the Arctic is recovering to saying that when it melts, it won’t be so bad because it has melted before…. Being wrong is correctable… being an idiot is permanent. Good luck with your survival. Deserts are concentrated in belts at 23 degrees north and south latitude called the Tropic of Cancer and Tropic of Capricorn. The equator itself is generally the warmest, wettest land on the planet. The reasons are mostly trade winds and ocean currents. Those presumably behaved the same in the LIG as they are driven by coriolis force (the earth’s rotation) and surface temperature gradient from equator to pole. Generally speaking colder means dryer as warm air holds more water vapor than cold air. Higher temperatures makes the water cycle faster – higher rate of evaporation at the surface, faster cloud formation, and more rain. The dryest place on the earth by far is Antarctica which is because it is also the coldest place on the planet by far. Outside the desert belts geography can cause wet/dry regions if things are right. In places where there’s a prevailing wind blowing up against a mountain range as the air follows the contour of the mountain upward it cools as it rises due to pressure drop. At the mountain base the air temperature tends to be above the dewpoint and as temperature falls in the rising air it hits the dewpoint and the water vapor condenses out in rain, fog, and dew. Then when the air goes over the top of the mountain and falls back down the other side it is very dry. This is really stark in Hawaii where one side of an island is a veritable rain forest and the other side is desert. Since the islands are so small most people touring an island see both rain forest and desert often in the same day touring by automobile or in the same hour in a helicopter tour. Obviously you must be some passerby not familiar with the normal site content. It appears the Arctic sea ice may be recovering, as the PDO has shifted to the cool phase, there has been no statistically-significant global warming since 1998, and the “recovery” is normally marked from the reportedly-disastrous 2007 extent loss which was a wind and compaction event. On longer time scales, it has been repeatedly noted there have been periods where the Arctic had much less sea ice than current amounts, and somehow the planet and the life on it survived just fine. If you continue to imagine “shifts” where there are none, perhaps you need to check with your doctor about a possible disturbance in your inner ear. Perhaps there is one even further inward. I don’t know what the entire globe looked like, but there were huge rainfed permanent lakes in both the Sahara and Arabia. Have a look at the site now. This 2006 paper agrees nicely with the recent paper by Stenni et al. that claimed that 130,000 years ago, the Antarctic was about 4 deg C warmer than now. The authors argue that the polar region temperature anomalies were so much greater than the planetary average due to positive feedbacks. The warmer Arctic temperatures greatly reduced snow, land and sea ice cover relative to present. This decreased the albedo on land and sea, which resulted in warmer temperatures. And yet the Arctic ice bounced back. No death spiral which lasted until today. Recovery is possible afterall. Greenland recovered from the death spiral AND the polar bears survived. AND the earth has had higher levels of Co2 in the past. AND…………………………. Would you agree that a non-AGW interglacial in which the arctic was 5C warmer than present signifies a huge amount of uncertainty in current IPCC projections? Drop the petulance and just stop and think about what you’re being spoon-fed. When you think of it, “death spiral” is a weird term for glaciers melting. The real death spiral is when glaciers advance so much that the next glacial starts. Glaciers are really looming natural disasters, and we’re very fortunate to live in a time when they’re not advancing. All this shifting of temperature variations in the arctic can be explained by a movement of magnetic north/south to the sun. The inner core stays in line(sum what) with the sun but the crust of the earth has been shifting south over the pole at a rate of 9 miles per year since measurements, the pole heading towards Russia in a wobbling manor and has been accelerated to 40 miles a year since the 70’s. This is a pattern that comes from low magnetic control from a inactive sun, like seen in the Dalton minimum and the mini ice age. If my hypotheses is right, the outer surface of the earth has shifted both north and south like a top winding down, wobbling, correcting, left and right, back and fourth but moving south all controlled by the suns wavering strength of the magnetism on us. Our distance and orientation relative to our sun adds to the forces on earth, stretching and flexing our faultlines expanding our earth. The poles were at the equator at one time, maybe a few times, it shifted all over the place. This explaining why Antarctic would have such old fossils of warm times and of been ice free and why we find opposite polarity in rocks, not from switching of magnetic poles. One step further in reasoning will bring you to the realization that there was never a ice age, just a shifting of the outer part of our earth moving south/north while the core still a lines with the sun, all moons face and rotate with the sun and rotate opposite it’s mother planet, we are born from the sun. Earths outer surface is like how a soup bubble moves around but the bubble stays in one place. This also explains how migrations and extinctions happen, and variations in carbon 14. Anywho just a thought! But the sun controls everything. Wikipedia eh. I suggest watching this page, archiving it if possible and monitoring whether some wiki editor (hmm. who could that be) begins an aggressive campaign to remove all of this. It is unusual for anything that is counter to the party line to last too long there, facts be damned. At this juncture I want to remind people about Greenland settlements during another warm period. The ice cores show that Antarctica was 4.5C warmer during the Eemian as well. 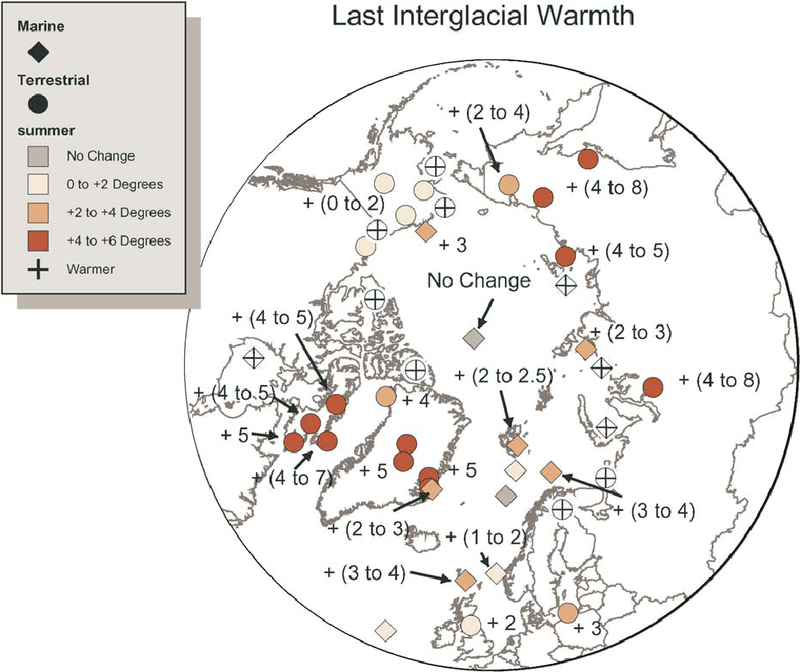 It is estimated that global temperatures were 2.0C to 2.5C warmer while polar amplification resulted in twice as much change at the poles (and there is also twice as much change in the glacial periods at the poles -10C versus -5C globally). Sorry, The surface of a SOAP bubble moves! hehehe! So I guess this website has shifted from saying that the ice in the Arctic is recovering to saying that when it melts, it won’t be so bad because it has melted before…. I confess that I too had this concern over a number of recent posts positioned as the Arctic sea ice graph continues to fall (and the temp graph holds out a little). Fred may have been rude but what he is referring to does look defensive and rather uncool. If we come right out and say: hey the trend since 2007 does not look like it is continuing this year, then what do we loose? Yes it’s warmer in the Arctic than the 1970s. Yes the wind blows the pack around, and yes the extent is low right now. We loose nothing of our scepticism. What really does amaze me is why we are not joyous at the warming of the Arctic, especially those of us in northern europe preparing for the next winter onslaught and a slide into La Nina. Only a few decades ago historical climatologists referred to warm-wet periods as climate ‘optimums’ and cooling as ‘deterioration of the climate’. They had good reason, as deterioration is linked historically with starvation, mass migration, invasion, wars and the breakdown of civilisation. Do we all secretly want the climate to deteriorate, to teach those warmists a lesson? No. Let’s say instead, hey, it’s warm, its natural, and it looks like we will all be just fine. 6000 years ago Hardangervidda was covered with forest. It’s hard to believe when you visit the barren place today, but evidence in the form of pine logs and roots can still be found preserved in the bogs. Was not the “Dinosaur Age” warmer? Our planet was closer to the sun and was rotating faster. The position of our planet plays a key role in temperature variations. Our planet is not fixed to the suns equator, hense, planetary drifting from suns pole to suns pole across the path of the suns equator. If it were not for the suns magnetic pull, we would be drifting out of the solar system (which is moving at an extreme rate of speed). Well this just blows the tipping point argument under the ice. Proving what we don’t know about Earth’s climate is massive. Why not just let the scientists get back to doing what they do, and forget the scare tactics. Politics is destroying the sciences. The only issue is from what I see in anecdotal data is the Holocene ended 2000 years ago and we are just waiting for a Heinrich Event for this glaciation to get firmly entrenched outside Antarctica. Cripes…a sea level rise of 9-15 feet!?!?!?!?! Head for the hills! Hey Lil Chucker Buddy, did you read the article or just miss this? I think our obsession on Arctic sea ice volume is probably because it is the only falsifiable model forecast that currently is in your favor. We skeptics try to win them all! But you missed the concealed gem of the peer reviewed paper. There is no tipping point. This is really stark in Hawaii ……. And the eastern high plains of Colorado – Kansas-Oklahoma! Unless we get upslope easterlies. Okay lets assume all this proxy and modeling business isn’t as bad as I had been led to believe by some people. A lot of you guys seem to accept it well enough in this paper anyway. And maybe they have a point that positive feedbacks contribute to global warming. This paper first and foremost, represents a review of the literature, four pages of citations. How much warmer were Eemian summers? Evidence from the surveyed literature paint a consistent picture. And they disavow “models” in favor of “observational data”. Hey Tim…when you say observational data do you mean proxies? Also Tim I don’t get the impression they “disavow” models. Did you really mean that? They just point out that there is not a perfect match between the models and the proxies. Doesn’t seem too surprising to me as it was 150,000 years ago. I only had to read to the end of the abstract to find the quaint but requisite genuflection to warmist superstition. I think the authors deserve thanks for saving our time. They came up with 6C warmer too. They are talking about the Milankovitch cycle. But if it was that much warmer in the Arctic during the Eemian, and also so much warmer about 7000 years ago – why do we still have Polar Bears? Shouldn’t they, ahem, have drowned or starved to extinction twice already? Who saved them? Al Gore wasn’t around then, was he? So I guess this website has shifted from saying…. Best hurry back to Real Climate and Climate Progress, Fred before you have an anxiety attack. Wow! I had NO IDEA that humans were driving SUVs back then. Look at the awful things we did to poor mother Earth! How do you know that buddies?, did you use a joystick instead of a hockey stick?. Some time ago I looked at the various Milankovitch cycles and came to the conclusion that the ones that appeared to have most effect were those associated with tilt rather than distance from the sun. This tilt varies the length of the seasons by up to a month giving a far greater average insolation for one hemisphere or the other when averaged over the year. This report states that the Arctic amplification is mainly in the summer rather than the winter predicted by the models. I do not understand why the models predict winter warming amplification at the poles. In my mind reduced winter sea ice cover would leave more open water and therefore more evaporation and radiation loss. There is little or no sunlight so the effect of lower albedo has got to be cooling. In the summer any reduced ice cover would lead to reduced albedo and both increases in absorption and radiation. However the big difference is that on land an increase in insolation would lead to a large rise in temperature. In fact the temperature would rise until the increase in outgoing radiation balanced the increase in insolation. This is a daily occurance in the desert where the temperature beween day and night varies by up to 50K. A lesser variation balances the average seasonal change in insolation. The sea and ice behave differently. The sea has the option of subducting warm water to create hot pools and also evaporates to eventually fall as rain in colder locations. These reduce the temperature excursions at the surface. These effects mean that the some of any increased insolation can and indeed must be stored. The same is true for ice where the melting effect takes a huge amount of latent heat (80 calories per gram in my out of date units!) Whilst this melting takes place there is an albedo change but little temperature change, reducing the increase of radiation into space compared with melting snow on land. The earth’s radiation balance has to be maintained over the long term but it is probably thousands of years before equilibrium is reached after a Milankovitch cycle change. During those thousands of years the non balanced portion is stored. The reverse happens during a cool cycle because the sea continues to radiate heat even when the insolation drops and will do so for thousands of years before a new balance is reached. During this period the warm pools will vanish and the ice build up during this time will also release latent heat and reduce evaporation and stop the world cooling as much as it would if it were all land. In my mind it is strange that the climate scientists say that the Milankovitch cycles cannot explain all the temperature excursions over the millenia. In my mind the changes in insolation and season length are more than enough to explain the changes in temperature. Indeed by the arguments above I would expect even greater temperature changes if the earth were predominately land. For these reasons I have my own theory about the interglacial periods. It is only a guess but I believe it starts with positive insolation in the Southern Hemisphere building large reserves of heat in the warm pools in the large southern oceans and melting the ice around Antarctica. Thus this half of the cycle leads to little increase in temperature but a large increase in heat stored or heat used to melt ice. When the cycle moves to the northern hemisphere the greater land mass and smaller ice coverage means that the storage effect is less and the temperature increase has therefore got to be greater. Thus if we are looking at proxies for global average atmospheric temperature I would expect them to be correlated with high insolation in the Northern Hemisphere. If we are looking at average sea temperatures I would expect this to correlate with high insolation in the Southern Hemisphere. By the way ice core data is an atmospheric proxy since it measures the air disolved in the ice crystal which eventually fell as snow. The best ice core research compensates for this when it calculates the surface temperature. Anyone have any data on this? when the satellite era began? So we really don’t know what is “normal”? No, alien observed thermometers. ;~P. Of course proxies. Granted, proxies have their own problems and interpretations, but they are at least something discreet, tangible, and with open methodology. The paleoclimate record ( from multiple sources) indicates most of the warming occurred in the summer months. Current model projections indicate winter warming. If my interpretation is correct and you concur, what word other than disavow would you select? It never fails to amaze me how different people can look at the same study and draw completely different conclusions. The causes of the Eemian interglacial was astronomical (i.e. Milankovitch cycles), as likely was the Holocene Optimum. Todays warming has no such Milankovitch associated cause, and as such, you would expect the dyanamics of the current warming to be somewhat diffferent as the cause is different. CO2 levels during the Eemian and the Holocene optimum were both lower than today, and IF the 40% rise in CO2 over the past few hundred years is indeed the cause of the current warming period, then you would expect the global effects and seasonal effects of the current warming to be different, as appears to be the case thus far. Record Arctic sea ice minima? Uhm, I don’t believe you have enough data to say that there has been any records. We just don’t know what the sea ice was like only 600 years ago let alone 6000 years ago. The ice currently in the Arctic could well be quite typical for interglacial periods. To say that today’s Arctic ice is atypical in any way is an intellectually arrogant statement in my opinion because as far as I can tell, there is no proof that the statement is true. We have much evidence pointing to the fact that Arctic ice was much less in this interglacial and in others past than it is today. We see some variation, yes, but to say it is atypical is a bit much. It means if one wants to read truth about climate knowledge there is no better place than WUWT. As you are the most recent to make a comment such as “So I guess this website has shifted . . .”, maybe you can explain why people make such statements. I do not understand such comments. Someone publishes a paper and WUWT links to it and summarizes it. Later, another paper appears, then another, then another. In some cases they say opposite things. We read them and learn, we try to understand how they relate to our current global and maybe regional situations. To say that “this website has shifted” its viewpoint seems a purposeful misdirection on the part of the person writing this. I agree than many people reading here have wondered why there is so much fuss over the amount of Arctic Ocean ice. If one believes that Earth is dynamic maybe they have a point. If one believes the recent past, say 40 or 50 years ago, was an optimum, well then, that’s an interesting viewpoint also. A kerfuffle does not seem too surprising. Years ago at Forbes Field in Pittsburg the news paper vendor would walk the aisles yelling “Something to read, something to sit on. Only a quarter.” Some choice! If you didn’t like the contents, too bad, you’d already paid. Now it is free; you can’t sit on it, but you could still print it out and line the bird cage with it – if you find it offensive. I find I learn things when I listen to different backgrounds and ideas, and because WUWT posts and posters provide a wide range of both I, and may others, come here. With respect to the topic of this current post you attribute a “shift” for the website that I don’t think exists. WUWT? With a constant magnetization, the zones of patches will be found near the equator if the discharge-tension is low, but far from the equator if the tension is high. An interesting train of thought, how does it relate to flash frozen mammoth meat? There was no evidence of significantly inflating CO2 levels in the atmosphere during the Eemian warm epoch. Not only that Plants and animals flourished in the expanded biosphere.Humans lived through it too. You need to reconsider your overt attachment to CO2 as a warming driver.It never showed up in the previous warming epoch and not in the current one either.Most of the warming up time in the Holocene ended around 8-10,000 years ago.While CO2 was around 200-220 ppmv. The warmest part of the present interglacial was over 7,000 years ago and never reached since then. There are no CO2 warming signatures at all shown on the charts. If he really was a Red, then it was a fine idea to outlaw him. Well Tim, see, that’s the thing. It seems like a lot of the people here didn’t like proxy data before but in this study it seems like a lot of ’em do. So I can’t help but wonder what was wrong with the proxy data earlier or what is better about this proxy data. As to disavow… I’ll have to disagree with your interpretation. When I look up the definition of the word I get things like: “To disclaim knowledge of, responsibility for, or association with.” Now in the paper all they say is that the models are “…not in perfect accord with model projections,…”. That’s hardly a disavowal. Then, on the same page they actually seem to use the results of model data to support one of their statements: “Climate modeling of the LIG also underscores the importance of snow, ice and vegetation feedbacks that amplify insolation-driven Arctic warmth (Crucifix and Loutre, 2002; Otto-Bliesner et al., 2006).” So I just can’t believe they have disavowed the models based on what I have seen so far. What I see is a paper that relies heavily on proxy data to come to a conclusion. They also do a very short compare and contrast of their results with some of the results of the model data. Or did you mean discrete? what i took away from the paper is that in spite of temperatures up to 8c warmer than present, and something like the gulf stream basically cutting from england right across the top of eurasia, there was still summer ice in the arctic basin. so no need to panic about a dubious .7c and sst anomalies in the tenths of a degree. and arctic ice was vastly reduced – but the polar bears and narwhals were fine, and the climate roughly stabilised within certain bounds…no scary tipping point was passed. sounds to me like Eemian planet Earth would have been a way cool place to be….. I know that. Current CO2 levels are far higher than they’ve been for at least 400,000 years, and likely even longer. The Milankovitch cycles are the most likely driver behind the Eemian and the Holocene Optimum, and CO2 levels were about the same during both at about 260-280 ppm. Essentially what the planet has seen over the past 250 years or so is a human CO2 volcano whereby humans are releasing large amount of CO2 via the burning of fossil fuels in a geologically short period of time. The current warming may or may not be related to this, but I think it far more likely than not that it is, as there is currently no other known cycles to account. In short, the warmth during the Eemian or the Holocene Optimum in no way disprove current AGW from CO2 release– and if anything, they confirm the basic notion of polar amplfication during warm periods just as GCM’s predict will happen with AGW. Or more specifically, there HAS been warming since 1998, but it just barely misses out on being “statistically” significant (so it is most likely real, but it could be a random fluctuation). AND that slight warming comes on top of the warmest decade in several hundred years (and perhaps several thousand years, depending on which proxies you believe). It may be time to retire this sound bite. If 2010 continues as an exceptionally warm year, I suspect that there WILL be “statistically significant” warming since 1998. This website is and has always been a repository of wide-ranging analysis, opinion, and debate. There is no single dogmatic line, which is obvious to anyone who cares to examine the incredible body of work presented. That being said, I have always maintained that Warmer Is Better. So for my part, I have adhered to that dogmatism faithfully. However, I respect and appreciate the diversity of opinion here. As to disavow… I’ll have to disagree with your interpretation. In other words, what the current GCM models predict will happen is not what the proxies indicate happened under similar circumstances in the Eemian. Please pick from the following: belittle, mock, ridicule, criticize, vilify, disparage, deride, scorn, knock, disdain, scoff; or more along the touchy, feelly lines of distinguish, compare, or discriminate. Another point he missed – skeptics let the data lead them to conclusions, not the other way around. in other words, we do not have to cook the books to make a point. We are trying to find out what the point is by allowing the evidence to lead us to it. AGW proponents reject anything that does not lead them to their preconceived conclusion. I am at a loss to understand your position now. If you accept that the Milankovitch cycles are the dominant effect you must also accept that we are about to enter an almost continuous decline in temperature. I am not sure if CO2 levels were higher or lower in the Eemian period because I am not convinced that the ice core data give realistic absolute levels. However this is a rather academic point. There would certainly have been an increase in CO2 as the sea warmed. Assuming this and the supposed increased moisture in the atmosphere (which current models assume) the current models would predict strong positive feedback. So why is it that this interglacial only lasted 16000 years. Where did the tipping point go? Don’t tell me it was because CO2 was not high enough. The IPCC are very clear that the dominant factor in their feedback is the impact of moisture that turns a small CO2 effect into something perhaps six times larger. Moisture does not care how the temperature was increased so if that temperature increase was there then so should be the amplifying feedback. The fact is that some or all these “greenhouse” effects must be false or are so puny, compared to the orbital effects, that they can do nothing to stop the inevitable. Hopefully we will eventually find the technology to actually delay or avert the next ice age; but I wager it will not involve CO2. 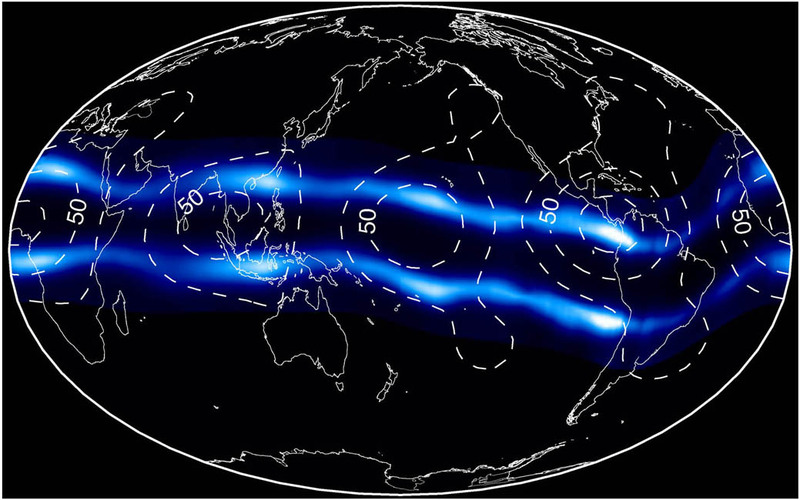 Below the plasma bands, a layer of the ionosphere called the E-layer becomes partially electrified during the day. This region creates the plasma bands above it when high-altitude winds blow plasma in the E-layer across the Earth’s magnetic field. Since plasma is electrically charged, its motion across the Earth’s magnetic field acts like a generator, creating an electric field. This electric field shapes the plasma above into the two bands. Anything that would change the motion of the E-layer plasma would also change the electric fields they generate, which would then reshape the plasma bands above. Santa announces his arrival, next Christmas, on his new Plasma Sleigh over the jet stream, which will go so southward as to making a wall of ice to secure the southern US border from the mexican cartels. GISS seems to be working hard to make this so. They have declared January-July 2010 to be the warmest in their 131-year record. Check out the recent history. Looking at the three latitude bands, from 2001 to 2008 the low latitudes (23.6°N to 23.6°S) were cooling, the southern latitudes (23.6° to 90°S) were holding steady, the warming was in the northern latitudes (90°N to 23.6°N) but the temps nosedived between 2007 and 2008. This was mostly corrected in 2009 with the adoption of the USHCN_V2 dataset, the low and southern latitudes show large increases for 2009, although the northern latitudes still had a small decrease. The hemispheric chart was made right again, with the Southern Hemisphere annual mean now showing a proper large jump for 2009 while the Northern Hemisphere, with its part of the low latitude increase, managed to display a noticeable rise. Guess that lack of statistically-significant global warming since 1995 (not 1998, my mistake) and non-statistically-significant global cooling since January 2002 was getting kind of embarrassing. Someone had to step forward and verify the science! In fact, the presence of an icecap in the Arctic Circle is very abnormal. There are very few occasions in the Earth’s more than 4 billion year existence when an icecap has been present in the Arctic, even during the occurrences of ice ages with extensive icecaps in the Antarctic Circle. Before the currently ongoing ice age and interglacial period, there was an icecap in the Arctic for awhile during the Permian. Before the Permian you must go backwards to a time before there were any trees or flora on the continents to find an icecap in the Arctic. Life and biodiversity flourished when the temperatures were greater than the past century, and they suffered when the climactic conditions were the same as the past century and colder. AGW, Global Warming, Climate Change activists often cite the precautionary principle as an excuse for taking actions in the absence of conclusive evidence, yet they refuse to take note of the general destruction of most of the life on this planet if it were ever possible for them to actually cause the decrease of carbon dioxide concentrations in the atmosphere by half or more and thereby end the photosynthesis of most or virtually all plant life. Such an act upon their part would make all of the genocides perpetrated by other socialists such as the Khmer Rouge, Communist Chinese and Mao, Soviets and Stalin, Hitler and the NSDAP, and all predecessors totally insignificant by comparison. Remarkable!. And those bands are up there, these are real not computer games, driven by the Sun and not by a Joystick. I dud the google thing. It looks like this claim by Peter Hodges is wrong. It is widely accepted that the last interglacial was much warmer than the current. wikipedia reckons the global average was much the same as now, since the southern hemisphere temperatures were lower thus balancing the higher northern. Basically a Milankovitch cycle effect. Guys please stop forgetting about half the planet. The southern hemisphere temperatures mirrored the northern hemisphere ones. There is not quite as much variability in the south as in the north but generally the temperatures follow the same track. The 800K ice core record from Antarctica. And then an 800K year high resolution record from north Atlantic Ocean proxies versus the Antarctic temps. (The chart is very busy but one should be able to get the idea). Note these proxies provide a different temperature record that those from the Greenland 110,000 year ice core data but I generally think the Greenland ice core data is not being calibrated properly. (the Younger Dryas needs to be berry berry scarry). Regarding the Milankovitch Cycles, I think it is important for people to understand that its changes are very, very, very small. They really should not be able to put the Earth into and out-of ice ages. In concrete terms, it is 300 kms. The variation in solar energy in the summer is only a change of +/- 150 kms. At the height of a downturn in the Milankovitch Cycles, Chicago’s has summer sunshine like Milwaukee (just an hour and half north up the road). At the peaks of the Milankovitch Cycle, Chicago’s summer sunshine is like Bloomington Illinois (just down the road again). It should make no difference at all really. But let’s say, the location is now the Arctic Ocean or Ellesmere Island or northern Greenland. Now that total change of 300 kms in summer sunshine is just enough so that the Arctic sea ice doesn’t melt anymore (it only takes a degree or so). The snow doesn’t melt completely in the summer at the higher elevations on Ellesmere Island and northern Greenland. The glaciers can only advance south if enough ice builds-up first and reflects more sunshine. The glaciers are always on a precarious balance where they frequently advance and retreat and what we have is much more variability in the northern hemisphere Ice Albedo and hence its temperatures. The glaciers are always melting profusely in the summer when they get down to Chicago, sometimes they back up to Winnipeg and then they advance again back down to Chicago. During the Younger Dryas, the glaciers still covered all of Hudson Bay and more than half of Canada. It was just the last advance stage. The forecasts for the Milankovitch Cycle (and these can be accurate out 5 million years) is that we are not going to have a big enough downturn to put us into another ice age for perhaps 50,000 years. This interglacial should be twice as long as the last longest one at 400,000 years ago (see charts above) where Greenland’s glaciers melted out of at least the bottom third of Greenland and forests actually grew in that area (as well as on Ellesmere Island and Baffin Island). We are in the good part of the Milankovitch Cycles if one is concerned about human civilization. The only significant warming there has been since about 1998 has been in the falsified datasets that are being increasingly corrupted with fantasy adjustments to fit the propaganda messages. We can see it it the plants we grow in gardens located in widely separate regions throughout the United States. We have plants which were too intolerant of cold weather to grow in Washington, Wisconsin, and New York in 196,1976, and 2010 that were thriving moderately well in 1995 to 1998. The cycle has changed, and it is getting colder during the past ten years as it returns to what we experienced about 1954 to 1979 in Virginia, Georgia, Tennessee, Kentucky, New York, Indiana, Illinois, Michigan, Wisconsin, Minnesota, Pennsylvania, Missouri, Kansas, Arizona, California, Oregon, Washington, Great Britain, Belgium, the Netherlands, Germany, Switzerland, Austria, Italy, Spain, France, Egypt, India, Japan, the Phillipines, Australia, New Zealand, Brazil, Bolivia, and Chile…to name a few. I have an idea for a science book, theory, on climate change, it is not solely about climate change but also about the physics of the Earth Sun System, it´s operation is analagous to an operational amplifier in electronics. By treating the earth as a homogenous and isolated simple Thermal Amplifier, it can be shown that the Holocene temperature record exhibits the properties of damping since the CO2 levels in the atmosphere levelled out at the end of the last ice age The so called Anthropogenic C02 has stopped our climate from large climate shifts and is good for the earth. Since I wrote this it has been brought to my attention that Bill Ruddiman has published several books which have some agreement with my theory but the physical design of the thermal amplifier effect is my own. The theory is based on Milankovich cycles, as the energy input source. Another logical outcome of my theory is that Human Evolution is a function of the evolution of the Earth. The theory states that we evolved our intelligence in the face of a cooling world and the reason for this was to reverse the cooling trend. Evolution of intelligence allowed us to control our environment, and as a consequence we changed the climate of the Earth. This process is irreversible as long as humanity survives, the next logical outcome is to achieve thermal equilibrium, which from the paleoclimate record is about 3degC warmer than current and requires a C02 level of 600ppm or roughly 3 times the Holocene average. It’s really hard not to notice the obsession with half the planet. But that is to be expected, as Climate Change (nee AGW) is half a theory, the other half being pinned on a trace gas (thin air). Be sure to watch Joe Bastardi’s Monday Sea Ice report. His approach is level-headed, as most good meteorologists are. “… Current CO2 levels are far higher than they’ve been for at least 400,000 years, and likely even longer. The Milankovitch cycles are the most likely driver behind the Eemian and the Holocene Optimum, and CO2 levels were about the same during both at about 260-280 ppm. Essentially what the planet has seen over the past 250 years or so is a human CO2 volcano whereby humans are releasing large amount of CO2 via the burning of fossil fuels in a geologically short period of time. The current warming may or may not be related to this, but I think it far more likely than not that it is, as there is currently no other known cycles to account. Mr Gates…. You still miss the point also….. The Current warming actually started in 1700, after a long period of cooling…. From then on, the planet has warmed. A question could be posed. What caused the cooling between 1360 and 1700? It certainly wasn’t a decrease in CO2, nor anything to do with Milankovitch cycles. Then between 1940 and 1976 there is a cooling in global temperature but a very significant increase in CO2… You described it as a “Human CO2 Volcano”…. But we recorded a cooling…? Very strange as far as promoting the hypothesis of AGW goes, don’t you think Mr Gates? But count on your logic falling on deaf ears. This correlation seems too much to be a fluke. The relationship is there and the starting point of research is why is it there – rather than denial of Milankovich forcing of glacial-interglacial cycle. One might as well argue that night and day are some sort of illusion and the reality is a continuous twilight. I can understand a climate establishment trying to gently draw people’s gaze away from these inconvenient facts. I guess the party line is fear of the consequences of the MSM and general public getting into a scare about an impending ice age. I have never understood this complacent hypotheses that the current IG will last 50,000 years. What exactly is meant by length of IG? There is a big difference between the width or FWHM of an IG peak, and the width of a plateau at the top. Our present warm conditions represent the top plateau of the holocene. Temperatures at the mid-peak or FWHM are at least 3C cooler globally. Conditions at the IG peak FWHM are “semi-glacial”. It is true that the precession and solar amplitude peaks and the eccentricity peaks are small right now just like 400 kyrs and 800 kyrs ago. But the IG peaks at both those times also had narrow peaks (although the 400 kyr IG had a wider waistline). The 800 kyr peak was a regular IG peak like all the rest. Every single one of the last 11 interglacial peaks have been just that – peaks. To argue now for a 50,000 year platuea would be to argue for something totally breaking the pattern of the last million years – you would need a good reason for this. Perhaps the argument is that the present glacial epoch is over? 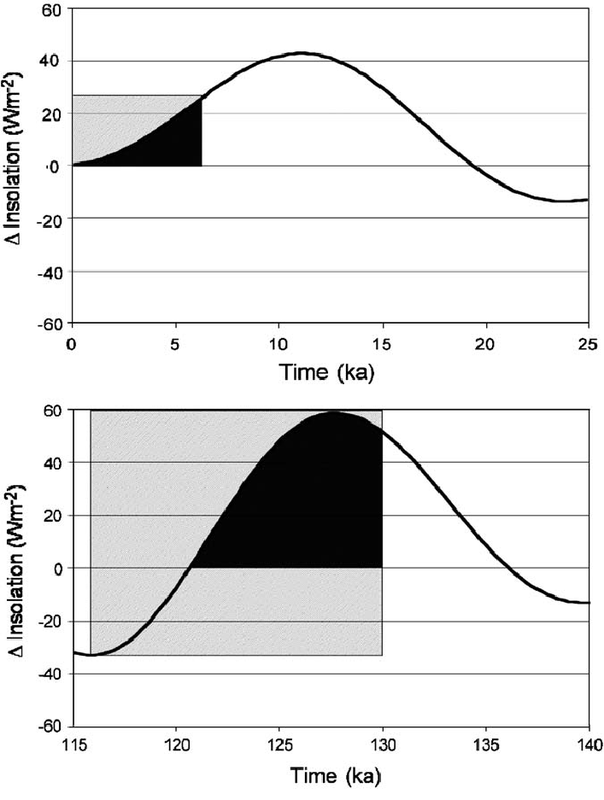 The graph at the top of this post shows that the insolation peak initiated the start of the interglacial – but the insolation does not coincide with the interglacial – it falls back as the IG proceeds. By the IG midpoint the insolation is already well past its peak. Some of the IGs coinciding with the solar and orbital Milankovich peaks are kind of double-peaks, e.g. at 200k, 500k and 600k yrs ago. On the gross scale the pattern is a saw-tooth of rapid temperature increases at the start of each IG and then slow ragged decline toward glacial maxima that are reached only just before the next IG. However, the IG peaks are peaks, and the start of the decline after an IG is always a sharp drop of 1 or 2 C globally. At a finer scale looking at more recent data, it is evident that within the Holocene, temperature peaks are also peaks, with a sharp rise and fall separated by more ragged oscillation. The one thing absent from the whole temperature record is any sort of plateau. We have all seen the Milankovitch Cycle charts. But what we have not seen is the temperature cycles and the Milankovitch Cycles on the same chart so we could actually see the correlation. And the match is not good at all. Here is the last 3 ice ages against the solar forcing at 75N. And here is the last 800K years. One can play around with the numbers and take 65S or 65N or just the 100K year orbital cycle or the 41K axial tilt cycle and none of them really work any better. A paper by Gerald Roe seems to have made the best analysis on how this system works. Generally, it is the change in ice balance – the delta ice balance (driven by the change in summer solar insolation) which governs the ice age cycles. So much ice can build up at certain points, that there is just not enough melt in high individual Milankovitch peaks to bring the system into an interglacial. The interglacials only hit every third or fourth Milankovitch peak. It will now take a really big downturn to bring back a high ice balance and the forecasts do not predict that for a long time. precession and obliquity indices [Imbrie and Imbrie, 1980]. But why are we sure that insolation per se is the key player? What jumps out of the graphs to me is that it is not individual peaks of insolation (there are too many of them) that are convincing forcers between glacial and IG, nor even the average value of insolation, but rather the amplitude of the oscillation of insolation. The maximum amplitude peaks coincide with the IG onset every time. Why? As Roe says the mechanism is ambiguous. What we know is that at the eccentricity maxima, the rates of change of both insolation and precession (amplitude of oscillation regardless of individual peaks) are also maximal. Perhaps this is a clue, but what physical processes could this entrain? I think Roe is right to draw attention to rates of change rather than individual values of parameters – he applied the principle to ice volume but the same could be applied to the astrophysical orbital parameters. My main original point (sorry for the shrill tone of the earlier post) was that – despite the complex raggedness of the temperature reconstruction and the differences in IG shapes due to changing amplitude of orbital parameters, the peak tops of all the IGs are all sharp. (The current one is already a bit of an exception by being flattish for ~10k years.) One should expect it also to drop “sharply” (on a scale of kilo-years) soon, not straight to full on glacial but at least a degree or two, as the (always rapid) start of a protracted – and sometimes interrupted – decline. A long prolongation of the current IG at current temperatures for 50k years would look very strange – it would look like the end of the current glacial epoch. The mere matter of over 700 atmospheric atomic tests between 1945 and 1980 injecting particulates into the stratosphere likely had something to do with that. Nothing to do with particulates, but interesting (especially the “little ones” caveat). The next serious cooling from Milankovitch Cycles is not due for quite some time…at least 10,000 years and probably longer. The current abberation in high CO2 levels (higher than in at least in any of the past 4 to 8 Milankovitch cycles) could well delay or even mitigate the effects. We are certainly not about to enter a period of a serious decline in temperature. All indications are quite the opposite. To speculate as to why a longer period (more than just a few years) was warm or cool you’d need to look at the total solar irradiance for the period. We know the Total Solar Irradiance increases with the solar cycle, and we know that during the Maunder Minimum and the Dalton Minimum we had very low total solar irradiance, and also during the period of around 1880 to 1940 we had lower total solar irradiance (based on sunspot numbers. When looking at the CUMMULATIVE effect of the increase in CO2 over the past 250 years or so, we would expect the effect of it to actually start off slow, and then build through the years as a few part per million are added each year, until the effect of CO2 gradually overwhelm any other natural variations. I think we saw this most dramatically in the period of 2008-2009, when the sun essentially went to sleep for almost two years and we saw the longest and deepest solar minimum in a century. Depsite this, the best the Arctic sea ice could do was sort of inch up a tiny bit from the very low summer extent seen in 2007. Now of course, the solar cycle is once more heading toward Solar Max in 2013, and the Arctic Sea ice extent minimum has stopped its so-called “recovery”. There are of course other natural cycles, besides solar and astronomical, namely, the ocean cycles, such as El Nino, PDO, AMO, NAO, etc. It looking at charts that show all cycles together, it seems the long-term rise in CO2 is now becoming the dominant signal. There are of course other natural cycles, besides solar and astronomical, namely, the ocean cycles, such as El Nino, PDO, AMO, NAO, etc. last graph on the page. That may be so, but there is also the ‘irritating’ Earth’s magnetic field change at the same time, see top graph. The next serious cooling from Milankovitch Cycles is not due for quite some time…at least 10,000 years and probably longer. Glad to hear you’ve got it worked out exactly what combination of orbital and solar parameters determined the start and end of interglacials (which are not precisely defined transitions anyway but a ragged and chaotic sawtooth with intermittent quasi-regular features). Why dont you share it with us? Or do you want us just to take your word for it that you understand it all. At close inspection glacial and interglacial are weakly defined entities. For instance in the middle of supposed glacial periods you have “mini-interglacials” that are extremely short – less than a single century, but where temperatures reach almost full interglacial levels. Can you talk us through the astrophysical initiation and immediate termination of such features. When looking at the CUMMULATIVE effect of the increase in CO2 over the past 250 years or so, we would expect the effect of it to actually start off slow, and then build through the years as a few part per million are added each year, until the effect of CO2 gradually overwhelm any other natural variations. Why? When in the history of the earth has CO2 overwhelmed natural variation? Instead CO2 has followed temperature. The Cryogenian and Andean-Saharan global ice ages (700 & 450 MYa) took pace with CO2 at 2000-5000 ppm. During the Huronian ice ages (2400 MYa) God only knows what the CO2 was, maybe as much as 50%. [O – I forgot – J he knows you and he knows you’re right!] All AGW attempts to explain these ice ages in high-CO2 atmospheres have amounted to evasion and distraction (e.g. dim sun), and I’m sure your answer will be no exception. On a planet mostly covered with liquid water, CO2 will never drive climate. Out of interest, what level of warming should we fear if (say) the level of atmospheric argon were to double? Or maybe helium? Or xenon? 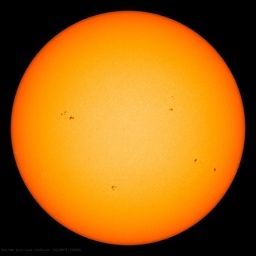 <I think we saw this most dramatically in the period of 2008-2009, when the sun essentially went to sleep for almost two years and we saw the longest and deepest solar minimum in a century. Depsite this, the best the Arctic sea ice could do was sort of inch up a tiny bit from the very low summer extent seen in 2007. Do you know what you are saying here? That in every solar cycle minimum, every 11 years, one should expect a clearly observable global minimum in temperatures? Do we see this in the temperature record? Has anyone on WUWT even argued for such a clearly non-existent pattern? This is a straw man that you erect again and again. “A sunspot dip! And no plunge in global temperatures!! OMG there must be overwhelming warming from CO2! !” This is an illogical non sequitur and demonstrates only your confusion. I don´t have all the answers, I have just asked the question, based on freely available graphical evidence, why doesnt the Holocene temperature profile look like the previous glacial cycles. The 5Myr climate signal shows increasing temperature amplitude with lowering tempeature, probably driven by ice dynamics as ice was the dominant factor over this period. The Vostok 400 kyr graph on Wikipedia with temp, Co2, Benthic 02, CH4 and radiative forcing shows 10degC variations in temp and similar variations in CH4 C02, for small variations in radiative forcing from 400 kyr bp to 14 kyr bp. “According to Discovery magazine, April 1999, the American Mastodon roamed here for about 4 million years until about 11,500 years ago. Another type, the Mammuthus primigenius, roamed around 400,000 years until 3,900 years ago. Both extinction times could be multiples of 3,600 years. Hidden up here [Rangell Island] in the Arctic, the mammoth hadn’t just survived the end of the ice age, it was walking these hills at the time of the Egyptian Pharaos, only 3500 years ago. This discovery has led to the re-examination of the complex chain of ’cause and effect’ that made mammoths die out everywhere else. The sun holds earth true north and dictates our orbit around it(sum what, we are moving away from it like all planets), but can not control the slippage, movement and expansion of the crust over the core. I believe the so called galactic dust( as they call it) is from our sun, like the asteroids, comets and meteorites that are born in our solar system. Solar expulsions/energy/winds move out from the sun, it was brighter and closer in our past, like all planets. A forcing from outside of our heliosphere entering controlling climate here on earth would be unlikely. Just movement of a hardened crust that formed over our molten earth after centrifuge separation from our star(like the moon from us and the suns thrust from our nebula). Placement in the solar system was/is conducive to our evolving atmosphere, intake or processing of gasses/hydrocarbons through atmospheric chemistry as nitrogen, oxygen, argon, c02 and 1% more water vapour and the creation of o3, no2, chlorine, etc. The amount of particulate and nuclei(iron, salts, minerals etc.) entering our atmosphere allowed for more H2O on our surface and the accumulation of minerals on earth, all from our sun. Life and the building blocks for life began here from our sun, because everything in this galaxy came from the same place. Us and all our sister suns have been moving away for center like the sparks from a pinwheel firework. Space is not expanding, just the distance between us as we move away. Sorry for all the miss spelling and left out atmosphere gases, But I hope you get the point! hehehe!